Are you a first generation college student and worried about deciding on your degree plan? Wondering what the difference is between a major, minor, and/or concentration? 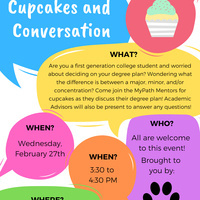 Come join the MyPath Mentors for cupcakes as they discuss their degree plan! Academic Advisors will also be present to answer any questions!